To remove Spyware Protect 2009, please download Malwarebytes' Anti-Malware from Here. Important Note: If you need assistance with Spyware Protect 2009 removal, please start a new topic in our Malware Removal Forum. I actually just saw someone post about this on the general discussion section of a forum I frequent. I sent them here. Ive been using this site for 4 years at least.. THIS WORKS guys!! had this lil bugger thankfully its gone now and lordy this program found vundo and a bunch of others that i have had before that wreaked havoc......!! this was such an easy fix and wonderful!! Just wanted to thank you guys for all your hard work..... you guys deserve a REWARD!!! Hello - My bosses system got this only today. I had the hard drive taken to be fixed. Had I been able to see this, maybe we'd be saving some frustration, time and $. Good to know for the future, thanks for posting!!! This does not work. 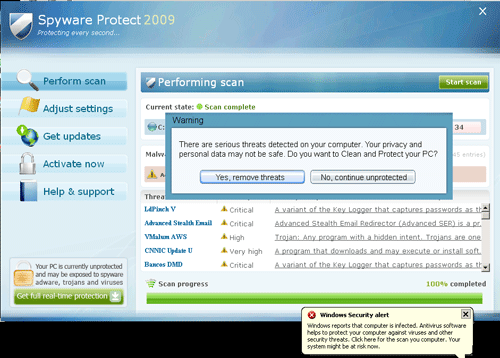 The Spyware Protect 2009 disabled my Adaware and Malwarebytes' Anti-Malware. I can not even remove and re-install these software. They just DO NOT run. at the same time, I have this www.windowsclick.com problem. I have tried A-Squired and Vipre. They did not work! Found the virus and Malware, but can not effectively remove them. My McAfee did not work either! The computer is having the same problem after re-boot. Please read the Malware and Spyware Cleaning guide and follow the steps there. If it doesn't work, post your logs in the malware removal and spyware removal forum. One of the trained staff members will be along to help you. I won't be, I'm still training. EDIT: Is this allowed if I'm in GeekU? or would this be considered helping someone? Edited by mkau, 15 April 2009 - 08:30 PM. Edited by gmanpopinjay, 18 April 2009 - 06:16 PM. You can remove spywares and malwares by using different tools but no tool can remove 100% spywares . I already had antivir and Malwarebytes installed but it is blocked from starting everytime start the computer. I constantly get a pop sound every time I try to open either of these and also ATF CLeaner, the task manager and many other functions. I just purchased this computer a few weeks ago and I hardly get to use it. please help!!! Hello, I just got this Spyware thing, and it doesnt let me open up my Malware software. Right now im in safe mode to use the internet, and i dont know what to do. I can open up MBAM in safe mode, but i cant update it in safe mode. And I cant open anything in Regular Mode. What do I need to do? A lot of sites and people don't recommend to do scans in Safe Mode; I was just wondering why. PS I also heard that sometimes we should rename the setup files in order to fool the viruses? Is it a ridiculous advice? Edited by Roman Pope, 22 June 2009 - 11:28 PM. SAS is good, Spyware Terminator I am not a fan as it was once a rogue, and Ad-Aware is getting out-dated. MBAM doesn't need to be run in safe mode as its better in normal mode. Some scans though are better in safe mode.